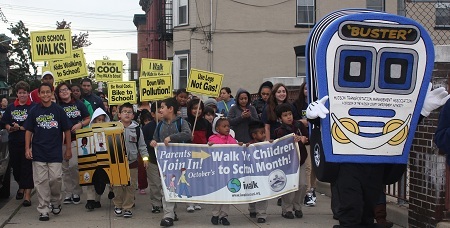 We invite grammar schools in Hudson County to participate in our unique program encouraging parents to walk their children to school rather than drop them off by car. 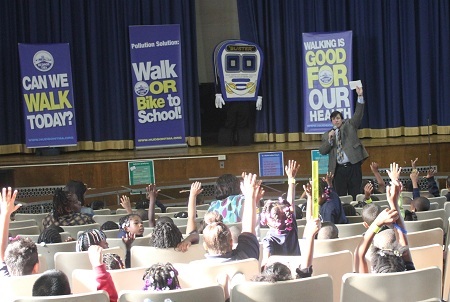 The TMA offers a fun, interactive, and educational presentation promoting the benefits of walking to children in grades K to 3. To “kick-off” and show support for the program, the TMA staff, accompanied by our mascot, Buster the bus, leads a one block ceremonial march to school with children and their parents/family members, and school staff. Walking to school promotes concern for the environment and healthy physical activity in children, and also improves safety conditions by lessening vehicular congestion around the schools. It affords families an additional opportunity to spend time together and to teach their children important pedestrian skills. While childhood obesity rates have more than tripled in the past 30 years, the number of children walking and biking to school has declined. According to the 2001 National Household Travel Survey, less than 16 percent of students between the ages of 5 and 15 walked or biked to or from school, compared to 42 percent in 1969. Any school district, principal, PTO, or parent interested in the program can call 201-324-6222 or info@hudsontma.org. 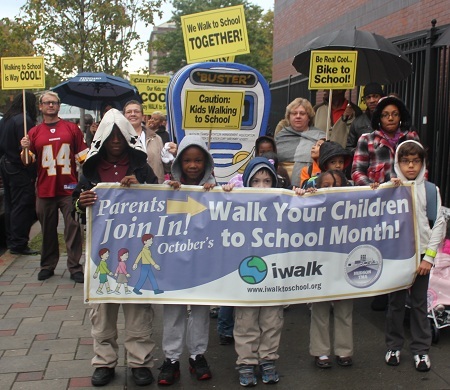 Download our Walk to School Brochure.